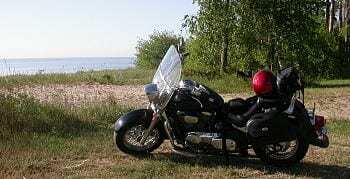 For many bikers their first look at the U.P. is when they cross the Marinette-Menominee Bridge. Actually most riders coming into the U.P. will find themselves crossing a bridge, just some bridges are bigger than others. Immediately after you cross the bridge their is a Michigan Welcome Center on your right. The historical log cabin is a great place to pick up information and use the bathroom. There are two main north-south roads that make their way through Menominee County. One is Hwy 41 which eventually hooks up with US-2 in Powers. The other is Hwy M-35 and I recommend this road because it takes you along the Lake Michigan lakeshore offering more than one great location to pull over and enjoy some beach time. Highway M-35 begins just north of Menominee, Michigan and continues all the way up to Highway M-28 near Negaunee, Michigan. Through Menominee County M-35 parallels the Lake Michigan shoreline offering many points where you can pull over and enjoy some quiet beach time. If you have a Michigan State Park sticker, the J.W. Wells State Park is about 30 minutes of Menominee and offers some nice camping, beach and bathroom facilities. Show the below businesses your U.P. Cruising Biker Discount Card to get their special biker discounts.